After watching my toddler stand at his play table or use ride-on toys as seats (with varying degrees of success) for months, we broke down & made the pilgrimage to Ikea. I looked for a couple of months on Craigslist to find some small wooden chairs for him, but nobody's selling, apparently. Tons of plastic ones, but I find them too flimsy. Not to mention they're going to be in the living room where I spend a lot of my time. I just couldn't face staring at more plastic stuff, no matter how much money I'd save. So we forked out the cash for a set of four. Once we got into the Ikea, Sprout was running around (mostly following the arrows in the showroom, so it was all good) & playing with everything. He actually spent quite a bit of time 'cooking' in the little kitchens that Ikea sells in their toy department. That settled it for me: I'd been intending to get him a play kitchen soon anyway. I was looking for that on Craigslist as well, but a sea of plastic was all I ever saw listed. We picked up the cooking pots & utensils that go with the kitchen, but no other toys for him. At one point he was really enamoured with a stuffed dog toy, but he was happy enough to put it back & go home without it--no MUSTHAVETHATTOY tantrums yet so far. We got home from Ikea relatively late but I did manage to get two of his little chairs assembled, to his delight. After putting the sprog to bed, however, I wasn't really up for assembling his toy kitchen. I tackled that this afternoon; one paper cut, some new calluses later & much time spent with a screwdriver & an allen key, the kitchen is all built. My child now has a nicer kitchen than I do. 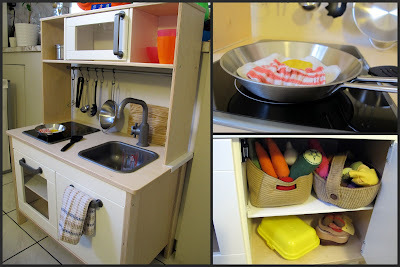 does the pole to hook the utensils/pans come with? if N, how did you do that? thanks! The rod across the back comes with the top part of the kitchen & includes 5 hooks.